Awwwwwww! 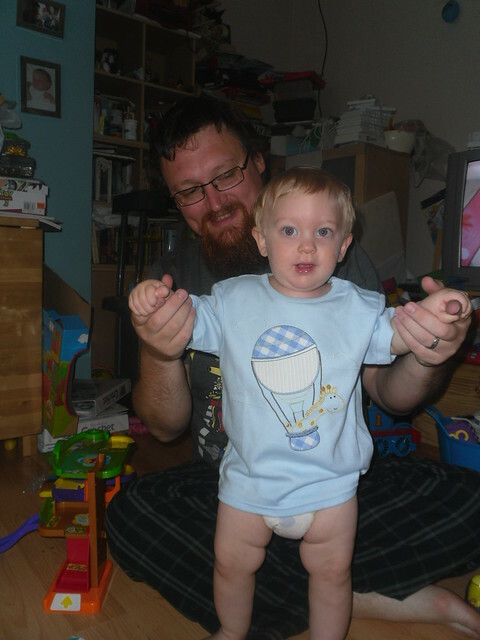 My Wee Tomska is a whole year old today! It's gone so fast, too fast. Isn't he a cracking lad though? Almost toddling too. He's had a fab birthday. Kathy and Jen came over for the day with their kiddies - it's half term so that made it even better. The 2 lads from across the road that are Jack's friends came over for a bit too. Tom seems to love all his presents. We gave him the Yojojo and Tinga Monkey toys from his Mame & Pape (they gave me the cash to buy him something he wanted), he got a car & garage set from Uncle Bob, Aunty Rach and Cousin Ben, Kathy & Katie (by coincidence) bought him some cars that are from the same set. How perfect is that? Jen, Adam & Conner game him a ride-on car that he already loves shuffling about on. From us he got mostly Weebles, along with a book and DVD. He's played with everything and loved it all. Jack and the bigger kids spent most of the day chasing each other round and round. Tom and the younger kids played mostly in the house with Tom's cars & weebles and Jack's trains. 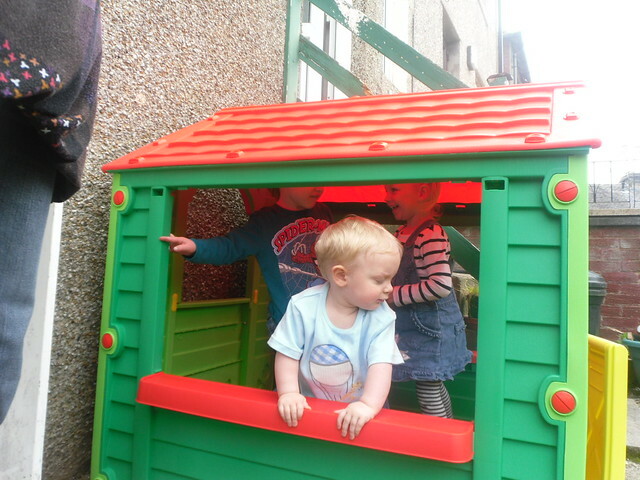 But EVERYONE played in Tom's BIG present.... the play house! It's been a great day though. I'm very impressed with all the kids, who behaved so well! Including my own two; Tom held his own until 2.30 when he finally started to nod off in my arms, and Jack coped amazingly well with not being the centre of attention or getting all the presents. He's getting to stay up a little late playing on the Wii with daddy as a reward.